Well this week we have a weekend-bursting bumper bonanza of shows coming up! We have shows from the very top of Scotland to the South of England with a lot in between. We shall be starting off our weekend journey in Dumfries on Friday. Then we are off to St Neots on the Saturday before ending our weekend in Liverpool. Let's get Ready For The Weekend! 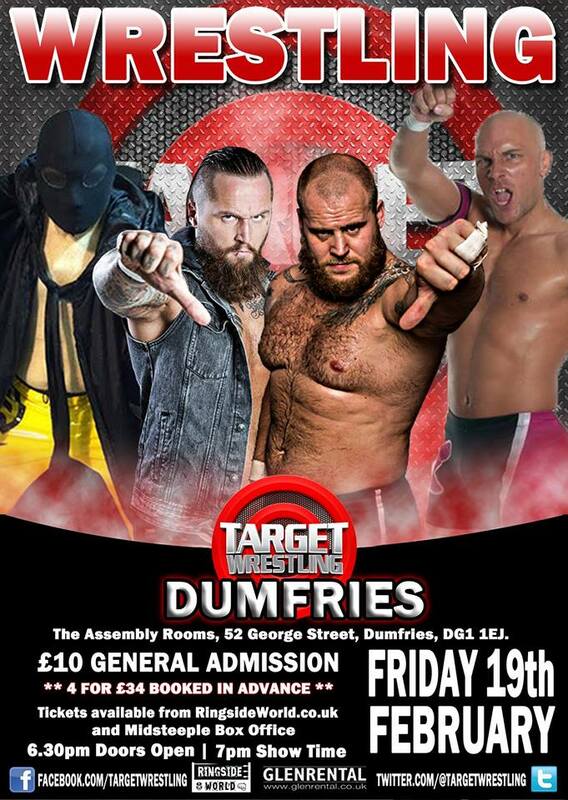 On Friday night, Target Wrestling make their return to Dumfries at the Assembly Rooms. Each Target Wrestling show seems to get that little bit bigger and this is no different. The event shall see Medallion once again defending the Target Wrestling Heavyweight Championship (a new version of which shall be unveiled on the night) in his favourite match, a Medallion's Rules match. However, his opponent will be possibly his least favourite as Michael Dante shall be the challenger. While many will know Dante for being a part of the Sumerian Death Squad, he is. One of the best heavyweight wrestlers in Europe with a hard hitting, fast paced style that very few men of his size can replicate. This may be a case of Medallion's own match working against him with his championship reign under real threat. Where one member of the Sumerian Death Squad goes, another is bound to follow as Tommy End will also be in action on Friday night. His opponent will be Shady Nattrass. A man who has made a name for himself in Target Wrestling with victories over a number of international stars. End will no doubt be his toughest opponent yet though. A man who is sought by the likes of PWG is no easy thing to combat and End's plethora of kicks and strikes may give Shady Nattrass a beating the likes of which he has never experienced. 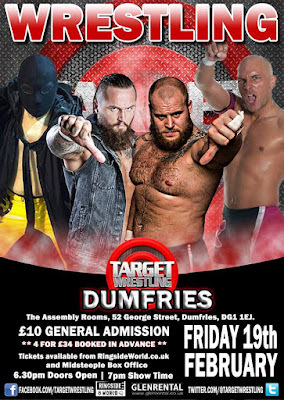 The Target Wrestling Tag Team Championship will also be on the line at the Assembly Rooms as Havok and Karnage will defend against Martin Kirby and a mystery opponent. While the name of Kirby's partner may be a mystery, his accolades as a tag team wrestler are well known. A multi-time, multi-promotion tag team champion who has defeated some of the best tag teams in the world. Havok & Karnage may have been at the top of the tag team division for a number of months but the experience of Martin Kirby and the unknown element of his partner may be the catalyst to end the reign of Havok & Karnage. Havok & Karnage (c) vs Martin Kirby & ??? Moving on to Saturday and Southside Wrestling host 'Battle Of The Egos 6' at The Priory Centre in St Neots. As always from Southside Wrestling, it is a star studded affair with a wealth of British stars alongside international names. One match which showcase this is Will Ospreay vs Andrew Everett. Both of these men are gaining more worldwide recognition as time goes on and it seems only right that they should meet in competition. Regardless of who wins, we are guaranteed a high-flying, non-stop show this Saturday. Another match with international flavour is the contest between BT Gunn and the current EVOLVE Champion, Timothy Thatcher. Gunn is quite simply one of the best wrestlers in Europe without question. His opponent is known as being one of the best wrestlers in the world with a championship to prove it. Gunn may have only had limited success in Southside so far but a big win could be just around the corner. If indeed that win would be over Thatcher then Gunn would have a legitimate claim to a championship match in Southside Wrestling. The main event for this Saturday will see 'The Righteous' Joseph Conners defend the Southside Heavyweight Championship against former champion, 'The Heavyweight House Of Pain' Stixx. Conners has been a dominant champion thanks in part to his aggression and also to The Righteous Army. Stixx was also known for having a impressive championship reign the last time he held the title. Stixx already holds a win over Conners in a tag team match. Now they will meet one on one except this time the match will be a Last Man Standing contest. Whoever leaves Southside Wrestling as champion will only do it by outlasting the other man. Finally ending the weekend on Sunday (as is tradition with a week) and New Generation Wrestling host 'Destiny 2016' at the Liverpool Olympia. The event will be headlined by the annual 20-man over the top rope rumble match which is particularly star-studded this year with the likes of Mark Haskins, El Ligero and Doug Williams all confirmed entrants. The winner will be leaving with a guaranteed match for the NGW Undisputed Championship. Speaking of the NGW Undisputed Championship, the current champion, 'The Showstealer' Nathan Cruz will join forces with his long-time adversary, Zack Gibson to take on The Control's Rampage Brown & Mark Haskins. While Cruz & Gibson may not like each other, they like The Control even less. The Control have attempted to exploit the bad feeling between Gibson & Cruz which at times has seemed to work. Can the champion and a potential challenger find the common ground long enough to deal a blow to The Control? We'll find out Sunday. As we previously mentioned, El Ligero and Doug Williams shall be in the Destiny Rumble but they will also be in singles action against each other. Ligero has achieved a huge amount in NGW as well as the UK as a whole. Williams on the other hand is simply a legend of British Wrestling with the accomplishments to prove it. This match will be a great encounter of two of the best in the UK.